The Dachshund is a hound breed. 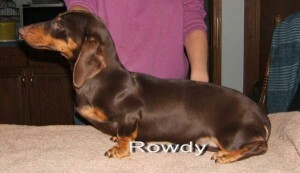 Standard Dachshunds were bred to flush badgers, while the Miniature Dachshund was bred for rabbit hunting. 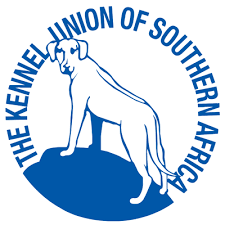 The modern Dachshund originated in Germany, and references to the breed can be found in books dating back to the early 1700s. 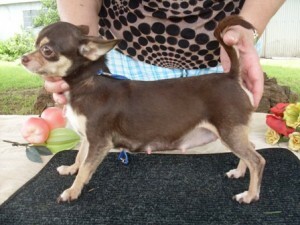 Originally much larger than they are today, breeders succeeded in giving the breed shorter legs that were more suitable for digging. 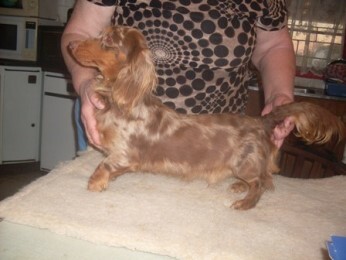 Although there are a variety of coats and Standard and Miniature Dachshunds sizes, Santitia kennels breed long-haired, and short-haired Miniature Dachshunds. less that 5 kg’s and about 17 cm high at the wither. 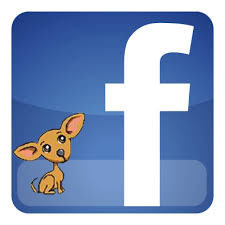 Many breeders suggest feeding Dachshunds puppy food throughout their lives. Their diets should include horse meat, beef, wheat, and yellow corn. 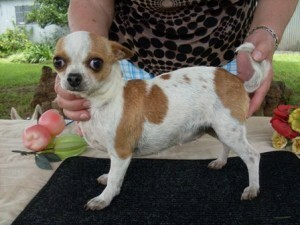 Care should be taken to avoid overfeeding, as these dogs are prone to obesity. 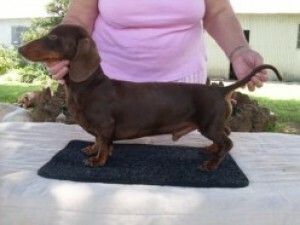 Dachshunds need regular checkups to keep them healthy. Grooming requirements depend on the dog’s coat. Long-haired Dachshunds need daily brushing. 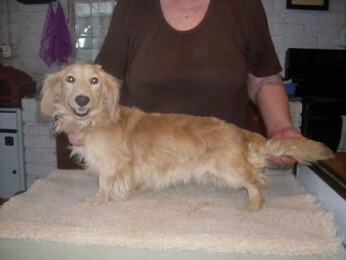 Wire-haired Dachshunds should be brushed regularly and trimmed twice a year. 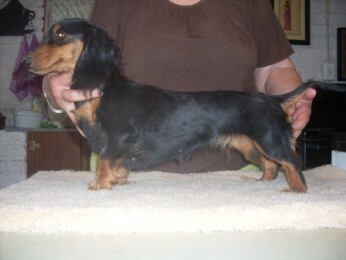 Short-haired Dachshunds can simply be rubbed down with a damp cloth. 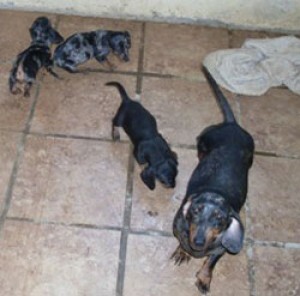 Dachshunds are usually kept indoors, and will do well in a small space. They are active indoors and out. 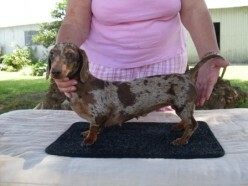 Dachshunds are friendly and outgoing, and they get along well with familiar people. 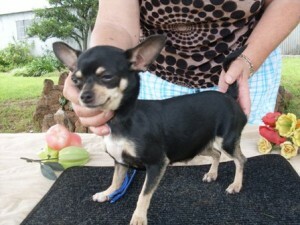 They are best suited to adults and older children. Dachshunds get along fairly well with other pets, but may become jealous of them. 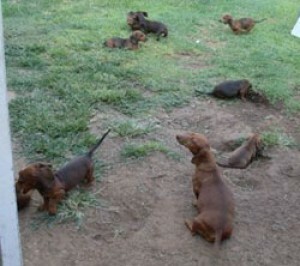 Dachshunds are willful dogs, and they require consistent training. They are difficult to housebreak. 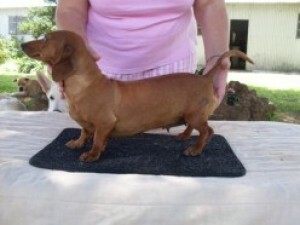 Dachshunds need daily walks and play sessions to keep them healthy and at an optimal weight. 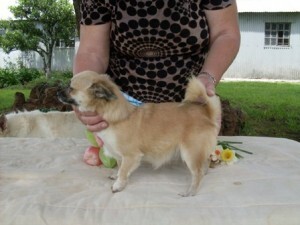 These dogs can injure themselves by jumping around too much, so it should be discouraged. 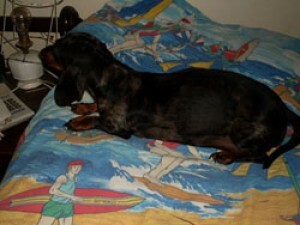 The most common health concern for Dachshunds is back problems. Intervertebral disk disease is quite common. Their long spines are easily injured, so it is important to take precautions to prevent them from getting hurt.